As of Sunday, November 11 — Veterans Day — Sellers Subaru has helped 123 veterans adopt animals for free. This feat is possible thanks to the MHS for Military program presented by Sellers Subaru, which is open to both veterans and active military personnel. The Michigan Humane Society launched this program just five months ago, yet it has already been a banner year. But these pets are more than just numbers. 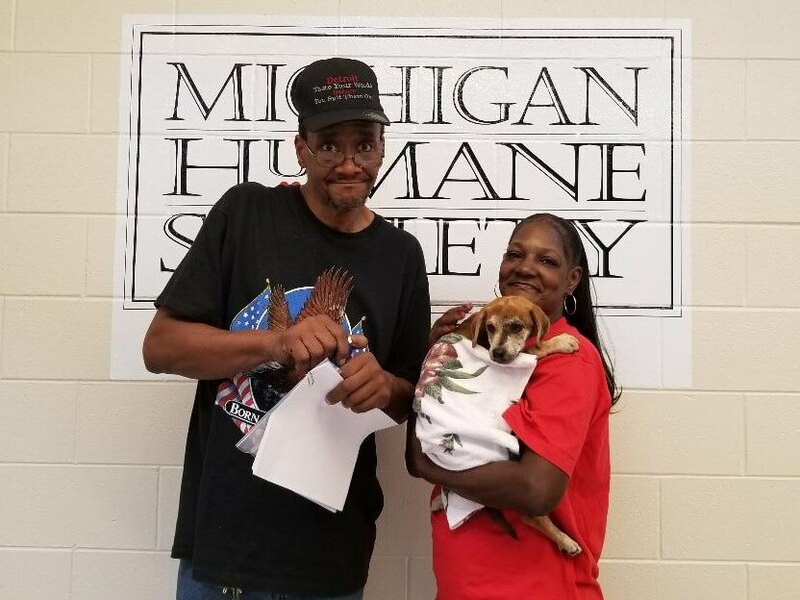 They include P-Funk, as seen here on Fox 2 Detroit with his adopter: veteran Doug Zawierucha. They include Sugar, which you can read her adoption story here. And they include these eligible dogs recently featured by presenting sponsor Sellers Subaru. The purpose of the MHS for Military program is to thank current and former soldiers by providing them with loving companions. Additional benefits also exist through the Pets for Patriots program. Do you know someone who qualifies? If so, please encourage them to visit a MHS animal shelter today, or see all of the dogs and cats for adoption in our Adopt a Pet section.